circa: late 1940s - early 1950s. 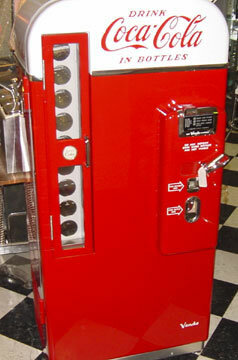 The Jacob 26 is the smallest and most sought after Jacob coke machine. It has the unique "mailbox" shape and vends the bottle out of the side of the machine. Vends: new and old bottles, Height: 54 inches, Width: 19 inches, Depth: 26 inches. or call 202-213-1585 (10 a.m. - 9 p.m East Coast time). circa: 1958-1959. This is the most popular cavalier machine. This electric machine has a red "Have a Coke" emblem which lights up when a coin is depostied and then allows a bottle to be vended. Height: 57 inches, Width: 25 inches, Depth: 22 inches, Weight: 280 pounds. Shipping outside of NC is approximately $500. circa: early 1950s - mid 1950s. Height: 40 inches, Width: 75 1/8 inches, Depth: 29 inches, Weight: 605 lbs. The following soda machines have just been or in the process of being restored. Expert experienced shipping with post purchase support. The Vendo 81 was manufactured between the mid 1950s and the late 1950s. It vends 81 bottles. 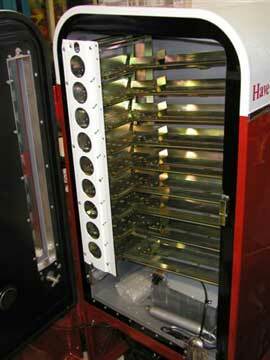 It can vend many different size bottles and it can vend up to nine different brands at the same time. It will vend any bottle that is less than 2 1/2" in width and 11 1/2" in length which includes most brands of beer, wine coolers and soda bottles. For this reason it is one of the most popular home machines. Its measurements are 58" high, 27" wide and 16" deep, 286 lbs. Two tone red and white paint with chrome molding separating the paint. Larger embossing on front door and more centered for a cleaner look. 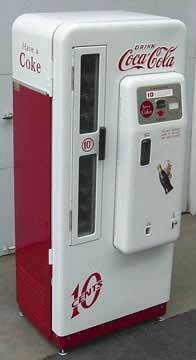 This machine has a mechanical vend system . Just install a coin and push down on the vend handle . This machine also has a light inside the bottle door. This is the most popular cavalier machine. This electric machine has a red "Have a Coke" emblem which lights up when a coin is depostied and then allows a bottle to be vended. Produced during the years of 1958 to1959. This machine has nine vending slots allowing for many different flavors. Most of these machines are painted to resemble a vendo 81. Specifications: Capacity: 72 bottles, Vends: 6 to 12 ounce bottles, Height: 57 inches, Width: 25 inches, Depth: 22 inches, Weight: 280 pounds. This machine is identical to the cavalier 72 except it is taller. Being taller it has 12 vend slots. It's an electrical machine and has no vend handle to push. Specifications: Capacity: 96 bottles, Vends: 6 to 12 ounce bottles, Height: 67 inches, Width: 25 inches, Depth: 28 inches, Weight: 350 pounds. Shipping: $450 - $500 to most USA locations. 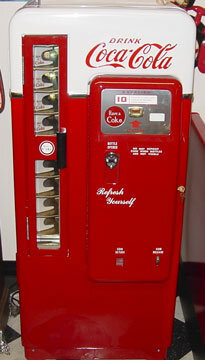 Shipping of coke machines to mainland USA locationswill cost between $450-500. Sorry, we do not ship to Canada and Overseas locations because shipping and customs can add over 50% to the prices.